Tips for DNA Testers–Creating Family Trees that Let Your Matches Connect – Lois Abromitis Mackin, Ph.D.
DNA databases just keep growing–Leah LaPerle Larkin’s August 2017 size update shows AncestryDNA topping five million, before the holiday sales. Wired reported that Ancestry sold about 1.5 million additional test kits over Thanksgiving weekend alone,1 bringing the total to about 7.5 million before the Christmas sales. I’m delighted to report that as the tests sold last fall are submitted and processed, my match lists are growing quickly. My AncestryDNA kit is getting between one and three new matches each day. My FamilyFinder kit on FTDNA got seven new matches in the first half of January 2018; it had twelve in December 2017. There is one aspect of the match list growth that isn’t quite so happy–the majority of my new matches2 don’t have trees or have trees that are completely private. I get it–many of you are new to setting up your DNA accounts and learning what you can do with your test results. Maybe you’re new to genealogy and just getting started. Maybe you don’t know your biological ancestry and are testing to discover it. First of all, I want to give you a big thanks for testing! If you’ve taken a few extra minutes to attach a tree to your DNA test kit, thank you even more! Any ancestral information you’ve attached to your DNA kit is tremendously useful to me and your other matches in identifying the ancestors we share. I hope you will add to your tree as you connect with DNA matches and learn more about your ancestry. As you build your tree I want to mention a few things for you to consider. The first is privacy and how it impacts the tree your matches see. As family history researchers, we really need to respect the privacy of our living family members, and not publish information about living relatives without their consent.3 To help us safeguard the privacy of living people, the genetic testing companies build privacy safeguards into their tree and sharing features. 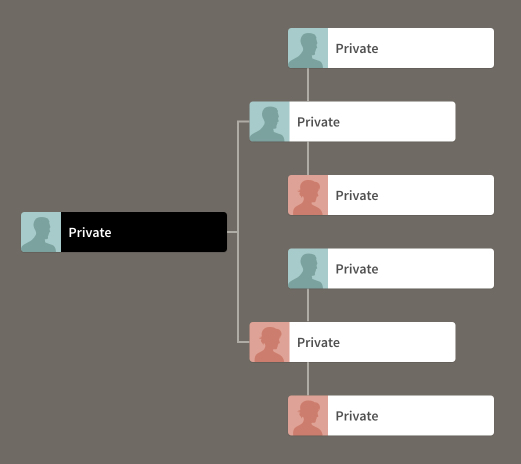 When you build a tree on Ancestry, any individual you indicate is living appears as Private to others viewing the tree. If this is the case, your other DNA matches and I may be disappointed that you haven’t given us any clues that point to how your family connects with ours. For this reason, it’s important to make sure that you haven’t inadvertently marked a deceased parent or grandparent as living. If you tested at one of the other testing companies, your relatives’ privacy is also safeguarded. On Family Tree DNA, in your kit settings, the genealogy tab, shown below, lets you specify who (the general public, matches, or no one) can see people in the FTDNA tree you attach to your kit. Also on the Genealogy tab, you can enter the names of your earliest known male and female ancestors, and you can attach a list of your ancestors’ surnames, with places where those ancestors lived. At 23andMe, you can’t build a tree attached to your kit. You can (and should) provide information in your DNA Relatives profile, which you reach from your DNA Relatives page, one of the options accessible from the Tools tab at the top of the page you see when you log in with your kit. On the right side of the page, next to Filters, is a blue “Update DNA Relatives profile” link. Once you click this, you will see options for how your DNA information will be shared with your DNA Relatives (AKA your DNA matches), your display name and more. You can enhance the profile your matches see when they click your entry on their match list with information about yourself. Under Ancestry, you can add information about the birthplaces of your grandparents and other ancestors, and indicate whether you have Ashkenazi Jewish ancestry. You can also add family surnames–please add at least four, and preferably more. 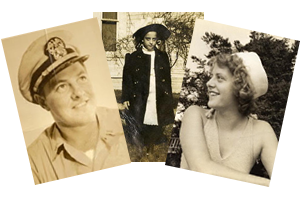 If you have a family tree on another site, there is a place to share the URL. As you are attaching a tree to your test kit at Ancestry and FTDNA and adding your surnames at FTDNA and 23andMe, I’d like you to consider a second thing: how far back you need to go in order to connect genealogically with your matches. This will vary, perhaps significantly, depending on your age and the age of your matches. For example, I was born in the 1950s, and my parents (now deceased) were born in the 1920s. My grandparents (also deceased) were born around 1900. I don’t have any first cousins, so if you’re one of my DNA matches, the ancestors we share are going to be great-grandparents or even earlier ancestors. If you were born later than the 1950s, you’ll need to include information on enough deceased generations in your tree or your surname list so we can get back to where our ancestry connects. If you can, I would love to see you include at least your eight great-grandparents, or as many of them as you can identify! 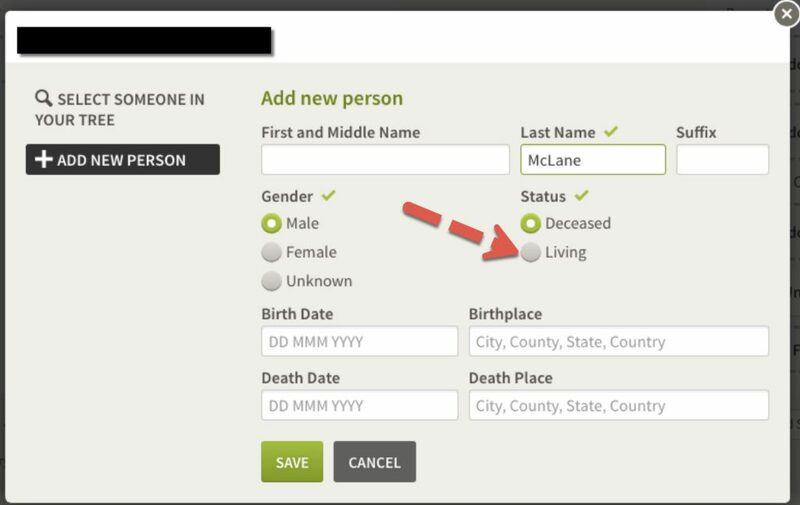 The final thing I’d like you to think about while you’re providing information about your family is including places in your tree and/or surname lists. It’s wonderful of you to include first and last names and birth and death dates for the ancestors in your tree. It’s even better when you include the places–ideally to the county level but at least to the state–where your ancestors were born and died. Along with the names, birth and death dates, and names of spouses and parents, place is the thing that tells me whether your ancestor might be my ancestor, or his sibling, or his cousin. This is especially true on 23andMe, where I can only see a list of surnames and places. Like many genetic genealogists, I have traced many of my ancestral families forward in time to the 1940 census. As a result, I may be able to recognize your family surnames, even if they’re different from the surname of the family where we connect. I have no problem taking the names, dates, places, and relationships you include in your tree and doing research to extend your tree backward in time (and I am happy to share that research with you), but I need names, dates, and places for non-living people so I can do that! I hope these three suggestions will help you to connect better with your matches. Thank you again for testing!